When it comes to the health of your eyes, you want the best. 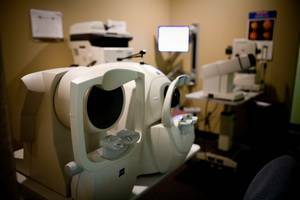 At Professional VisionCare our highly skilled optometrists near Gahanna and New Albany use the latest technologies in testing and treating your eyes. Providing quality eye health services in Westerville and Johnstown is what we are all about. Our state of the art testing equipment ensures that we can provide you with the most complete evaluation possible. For example, a retinal camera allows us to do Retinal Photography a valuable tool in detecting and managing problems such as diabetic changes, hypertensive retinopathy, macular degeneration, optic nerve disease, and retinal holes or thinning. We test for a wide variety of eye diseases and conditions, including glaucoma. Many diseases, like glaucoma, gradually steal sight without warning, early detection is vital to stopping the progress of the disease. We use the latest detection and treatments available including tonometry and ophthalmoscopy. If you have ever gotten sunblock in your eyes, you are aware how excruciating it can be. Discomfort will likely last for some time, relief will come sooner with immediate attention.